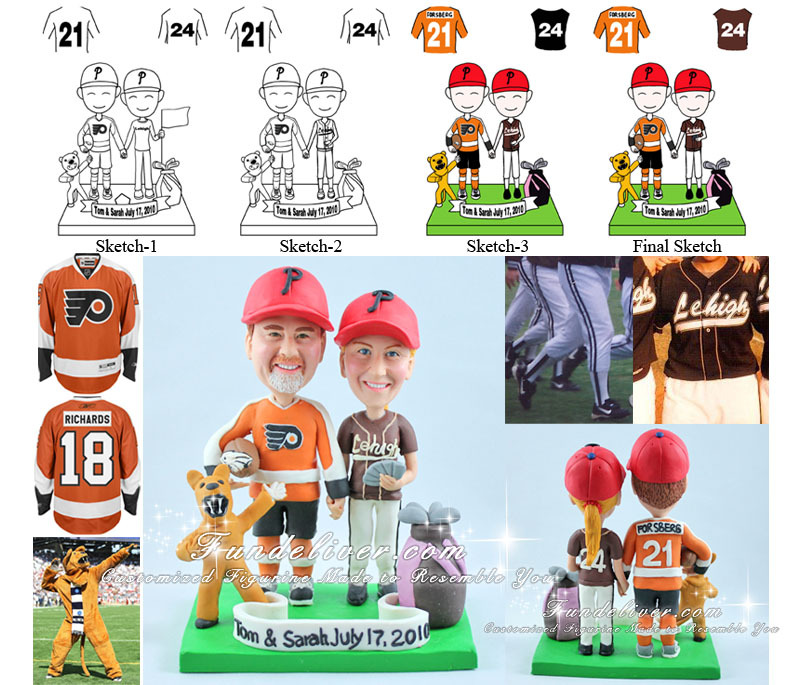 This is a completely customized Philadelphia Flyers theme wedding cake topper ordered by one of our customers. They would like to include Phillies, Flyers, Eagles, Golf (they are both avid golfers) and references to their alma maters: Groom went to Pennsylvania State University (Penn State) and Bride went to Lehigh University. So here is the design. Groom: Orange Philadelphia Flyers jersey - Forsberg, number 21, went to Penn State - putting a small Nittany Lion (mascot of the Pennsylvania State University) next to him, holding a football with Eagles logo. Red Phillies hat. Bride: played softball at Lehigh University, number 24 – brown Lehigh Jersey with Lehigh logo in white block letters across the front and 24 on the back. Long pants and stirrups. Red Phillies hat. Other items to feature: They both play golf so want to add a bag of clubs standing next to bride. They like to play poker so a deck of playing cards or a 5-card hand fanned out are considered and made. Philadelphia sports teams: Flyers, Phillies, and Eagles. 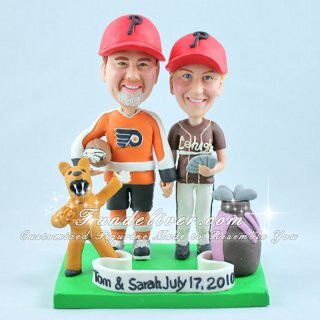 If you are same Philadelphia sports team fans, don’t forget to check our other Philadelphia Phillies Wedding Cake Toppers and Philadelphia Eagles Wedding Cake Toppers. Remember these are special hand-made cake topper, so you can almost specify any style you love. Just tell us your idea, we will work with together to make your wedding perfect.